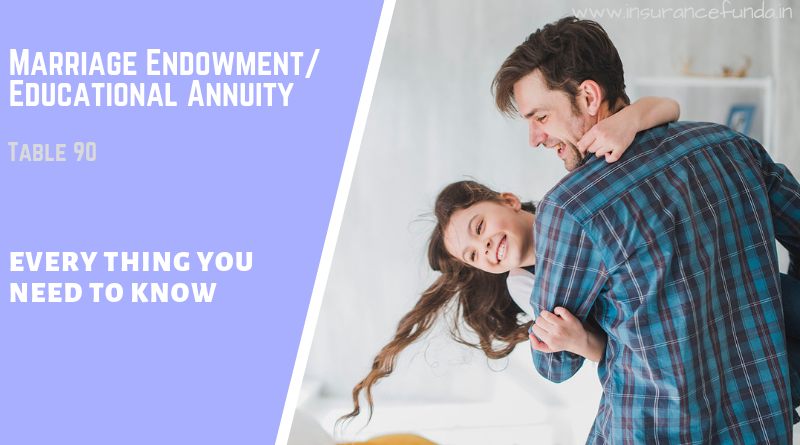 LIC’s Marriage Endowment/Educational Annuity Plan – Table 90 – is a specialized endowment assurance plan intended to help parents of young children to manage the marriage/educational expenses. LIC has withdrawn this plan from sale and hence it is no more available. Here at InsuranceFunda, we get a lot of queries about the benefits and details of the plan. This post will help you to clear your doubts about all the benefits of the plan. Premium has to be paid for a period equal to the term of the plan or death of the life Assured (whichever is earlier). Maturity Benefit includes Sum Assured + Accrued Bonus + Final Addition Bonus (if any). Maturity benefit can be obtained as a single installment or in 10 half-yearly installments (And that is what the name educational annuity implies). Installments will be calculated at the rate declared by the corporation from time to time. The minimum term of the plan is 5 years and the maximum term is 25 Years. Minimum age at entry is 18 and the maximum age at entry is 60 Years. Accident Benefit Rider shall be availble on payment of rider premium . On Death of life assured during the term of the policy:All further premium will be waived and Sum assured along with vested simple reversionary bonuses and final addition bonus shall become payable. On Life Assured Surviving the date of maturity: Sum assured along with vested simple reversionary bonuses and final addition bonus shall become payable. Proposer or his assignee or the nominee has the option to get the claim amount in 10 half-yearly installments if needed. Enter the details of your policy in the fields given below to understand the maturity and insurance benefits of the plan. Let us consider an example of a person taking the Marriage Endowment /Educational Annuity plan. Let the details of the person taking the policy is as shown below. Low premium compared to other endowment plans. Inbuilt premium waiver benefit on the death of the life assured. Maturity amount is assured, irrespective of the fact that the life assured survives the term or not. Maturity amount can be converted to an annuity of 10 half-yearly installments, if needed.